The Thunderbird entered production for the 1955 model year as a sporty two-seat convertible. Unlike the Chevrolet Corvette, it was not marketed as a sports car. Ford positioned the Thunderbird as an upscale model and is credited in developing a new market segment, the personal luxury car. In 1958, the Thunderbird gained a second row of seats. Succeeding generations became larger until the line was downsized in 1977, again in 1980, and once again in 1983. Sales were good until the 1990s, when large 2-door coupes became unpopular. Initial production ceased at the end of 1997. In 2002, production of the Thunderbird started again; a revived 2-seat model was launched which was available through the end of the 2005 model year. 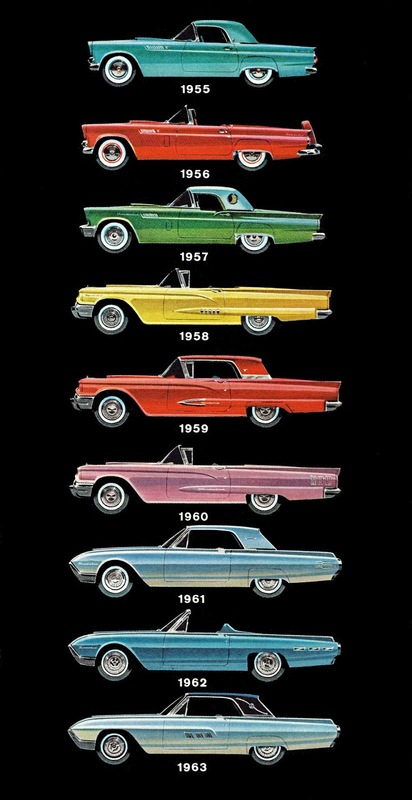 From its introduction in 1955 to its final phaseout in 2005, Ford produced over 4.4 million Thunderbirds. A smaller two-seater sports roadster was created at the behest of Henry Ford II in 1953 called the Vega. The completed one-off generated interest at the time, but had meager power, European looks, and a correspondingly high cost, so it never proceeded to production. The Thunderbird was similar in concept, but would be more American in style, more luxurious, and less sport-oriented. The men and their teams generally credited with the creation of the original Thunderbird are: Lewis D. Crusoe, a retired GM executive lured out of retirement by Henry Ford II; George Walker, chief stylist and a Ford vice-president; Frank Hershey, chief stylist for Ford Division; Bill Boyer, designer Body Development Studio who became manager of Thunderbird Studio in spring of 1955, and Bill Burnett, chief engineer. Ford Designer William P. Boyer was lead stylist on the original 1955 two-seater Thunderbird and also had a hand in designing the future series of Thunderbirds including the 30th Anniversary Edition. Hershey's participation in the creation of the Thunderbird was more administrative than artistic. Crusoe and Walker met in France in October 1951. Walking in the Grand Palais in Paris, Crusoe pointed at a sports car and asked Walker, “Why can't we have something like that?” Some versions of the story claim that Walker replied by telling Crusoe, “oh, we're working on it”... although if anything existed at the time beyond casual dream-car sketches by members of the design staff, records of it have never come to light. Walker promptly telephoned Ford's HQ in Dearborn and told designer Frank Hershey about the conversation with Crusoe. Hershey took the idea and began working on the vehicle. The concept was for a two-passenger open car, with a target weight of 2525 lb (1145 kg), an Interceptor V8 engine based on the forthcoming overhead-valve Ford V8 slated for 1954 model year introduction, and a top speed of over 100 mph (160 km/h). Crusoe saw a painted clay model on May 18, 1953, which corresponded closely to the final car; he gave the car the go-ahead in September after comparing it with current European trends. After Henry Ford II returned from the Los Angeles Auto Show (Autorama) in 1953 he approved the final design concept to compete with the then new Corvette. The name was not among the thousands proposed, including rejected options such as Apache (the original name of the P-51 Mustang), Falcon (owned by Chrysler at the time), Eagle, Tropicale, Hawaiian, and Thunderbolt. Rather, it was suggested to the designer and, in the hurry-up mood of the project, accepted. It is rumored that Jack Austen Crabbs of Davenport Iowa was the owner of the Thunderbird name. Ford acquired the name from Mr. Crabbs requiring him to rename his car the "black flame". The word "thunderbird" is a reference to a legendary creature for North American indigenous people. It is considered a supernatural bird of power and strength. Thunderbird Country Club in Rancho Mirage, California also lays claim to being the inspiration for the name of the car. Ernest Breech, a Thunderbird Country Club member, who was then chairman of Ford Motor Company was supposedly deeply involved in the creation of the Thunderbird. Breech asked the Club's permission to name the new model after the Club and the club consented to the use of the name.